Daniel, the Godly youth, was in a bad way. He had been carried off to Babylon and separated from all he had known. He was under the earthly sovereignty of King Darius, while Babylon the city and the Kingdom of Persia was at its peak. Darius was pleased with Daniel and had planned to set him high in his court as a second-in-command administrator. The other administrators were jealous and plotted ways to defeat Daniel by stealth. They tried to find something with which to charge Daniel, but could not. They said if we find something it will be having to do with His God. So the jealous administrators went o King Darius and urged him to make a decree that anyone who prayed to another god except to Darius for the next thirty days should be thrown into the lion’s den. Darius liked the idea, and made the decree. That’s where we pick up the above verse. Daniel heard the decree had been set, and according to Persian law kingly decrees cannot be repealed. First it should be mentioned that Daniel did not compromise. Likely he had men telling him that “it’s only 30 days, just ride it out. Just don’t pray to Yahweh this month’. Daniel did not compromise. As a matter of fact, he went immediately to his room and prayed. The jealous administrators knew Daniel would, and they spied on him just as immediately. We know the story. Daniel was ‘caught’ by the jealous administrators, and Darius reluctantly sentenced him to the lion’s den. God showed His majesty and power by shutting the lion’s mouths and Daniel was unharmed and released. Note the verse though. The NIV has it most clearly but all verses say the same. Daniel was making supplication to the LORD. Daniel prayed- to ask for help. Daniel knew he’d been painted into a corner. Instead of looking around at his shrinking options, he looked up. He asked the Lord for help. The help came. It was to sentence Daniel and throw him into the lion’s den!! Daniel knew His God had the power to save him or the power to allow him to die. Daniel was a Godly man. However, Daniel was a man, and no doubt he was scared to face lions and wondering about this version of the help he had prayed for! Nevertheless, Daniel trusted God. When we pray to God for help, He hears our prayer. He is a good, good Father who knows the number of hairs on our heads. If He cares for the sparrow which is a small insignificant bird, will He not care for us, His children? He will! However we never know in what form the help will come. God will always shine His glory, and in so doing He might make circumstances that we can see with our fleshly eyes seem dire. Our eyes can only see so much less, like, 10% of what is going on at any given time. We can’t see the invisibles, the heavenlies, and the circumstances beyond our eye and ear range but they are all working God’s will to His glory and our good. (Romans 8:28). The key is to pray, ask for help, and then to trust the outcome. Even if it is our moment to part the veil and go to the other side, God will hear our prayer, and He will use our situations to show His glory. 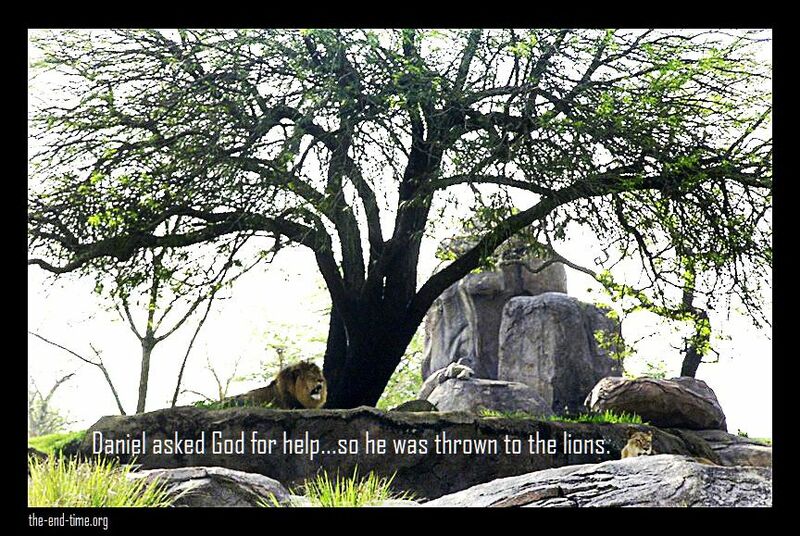 Trust and obey, as Daniel did, even if we are thrown into a metaphorical lion’s den!